After reading a blog entry entitled the world UNPLUGGED, I was inspired to write up a small study of my own to conduct with my students during a service trip I was leading during spring break. After all, we were going to be in the middle of nowhere with no Internet access. I was curious to see whether the experience would be enhanced by the fact that we were going to be unplugged from the rest of the world. I presented the study to the students who were taking part in the Alternative Service Experience during Spring Break and they all agreed to take part. We were to spend one week volunteering with Eye on the Rainforest, staying at Las Casas de la Selva, in Patillas, Puerto Rico. Using recycled paper, we created journals to write our reflections. Students were to write one entry just before leaving, one in the middle of the week, and one at the end of the trip. At Las Casas de la Selva, we organized the sheds and wood workshop, deconstructed an old roof, and even dug a ditch for a new floor. I was mostly in charge of cleaning and organizing the library. The days were long and the work was strenuous. In the evenings we were all pretty tired but we still managed to find time to reflect and share on our daily activities. The first entry that the participants had to write was about the fears, uncertainties, and misgivings they were having in the face of no Internet access once we arrived to our destination. At the airport in San Juan, upon landing, I reminded the participants to send their last messages and to sign off. Their comments were not surprising and mirrored my own fears. They were all wondering whether they would feel alienated, lonely, lost without their familiar surroundings, their constant check ins with families and friends, their cherished connections, and their daily routines. They felt that their world without texting and IM-ing would be lost and unbearable. Some feared missing their loved ones and wondered how the week will pass without their one constant, their IPhones. However Las Casa de la Selva was a feast for the eyes and the soul. It is easy to forget about the world when one is in the midst of majestic trees, with the Puerto Rican coquí frogs lulling us into slumber with their songs from dusk through dawn. During the middle of our stay, after having had time to relax on a beautiful beach and visiting Old San Juan, students’ reflections on being unplugged were so rich and encouraging. I was pleasantly surprised to hear how happy and relieved they felt without the technology. Most expressed comments that said they felt they had more time, lived more mindfully, and felt more connected and alive than ever. When one student admitted she felt so relieved and had not realized how enslaved she was by her IPhone, others echoed in agreement. I will have so many messages when I come back. I am not looking forward to that. It is going to be very hard to go from Skype-ing my boyfriend every day to no contact at all. The last time I was Internet-less and phone – less was… I can’t remember if that ever happened. This isn’t so bad, but I’m sure I’m missing a lot of emails and group messages. I feel extremely relieved. I have absolutely no desire to check on social media or communicate with anyone other than my mom and sister. Who knew how nice it would be to have a free pass to not have to respond to texts messages and emails, given that everyone knows I am in the middle of the rainforest. When we got to PR I was so caught up in the excitement of being in a new and beautiful place that I forgot all about my phone. I never once wished to get on social media during the trip. I feel as though the experience of being in the rainforest would not have been as great if we did have the internet with us, because we would have been heavily distracted and incapable of fully absorbing the moment. Only 6 notifications popped up on my phone in Charlotte. I do have 80 Facebook notifications and about two dozen emails. It actually isn’t as bad as I thought it would be. For some reason, social media has a way of making you think that you need to be keeping up with hundreds of people. We have been conditioned to think that we are missing out if we don’t scroll through a day’s worth of Instagram, Facebook and even Twitter postings every single day, and for some every single hour. Man, Social media has been exhausting me and I didn’t even know it. Now that I am back, I noticed that I wasn’t checking social media nearly as much as I was before the trip. When we got to PR I deleted all my social media and I only re-downloaded Snapchat and Instagram once we got back home, leaving behind Facebook and twitter. It feels good to be less attached to my phone now. If people didn’t have the expectation that I will receive their messages and calls immediately and respond shortly after, I wouldn’t check my phone on a regular basis at all. I think it’s important to live in the moment, and phones greatly hinder our ability to do that. Constantly being connected to an entire network of people is a lot to deal with and can be stressful. Although there are many benefits to having a smartphone, going on a Digital Sabbath has made me question if they are really worth it. 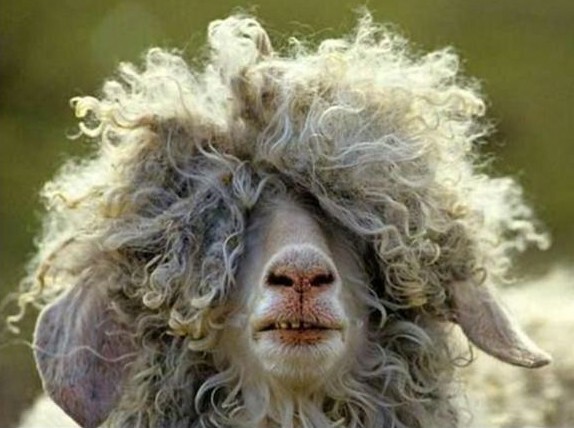 Now, I am not nearly as amused by social media as I was before, and have greatly lowered my Internet activity. Disconnecting from technology even for one day a week has its benefits. It allows us to recharge and refresh. It gives us time to reconnect with nature, to be fully present, and to awaken to our dreams and goals. During this one week Digital Sabbath,the students were given a glimpse of what life is without the constant barrage of emails, texts, calls, and notifications, that buzz and ping us 24 hours a day. Unplugging for one week or for one day shows we are plugged in to what truly matters. My educational philosophy was and is anchored in the belief that all students are capable of learning, that teachers can potentially be the only role models in a student’s life, that tailored learning, enthusiasm, repeated exposure, and hands on practice are all essential for learning to occur, and that the strengthening of students’ self esteem is key to successful learning. As such, the ideas of Dewey on the importance of education as a place to learn not only content knowledge but how to live, evolving around the realization of one’s full potential, and the ability to use those skills for the greater good, truly resonated and still resonate with me. A statement by Seymour Papert illustrates well my thinking at that time: Better learning will not come from finding better ways for the teacher to instruct but from giving the learner better opportunities to construct. I knew then that what truly mattered in teaching are the opportunities I create for my students to engage with their learning. It became apparent to me that I needed to 1) give students plenty of opportunities to connect with knowledge and 2) encourage dialogue and exchange. I organized my curriculum in a spiral manner to ensure that students were continually building upon what they had already learned and used project based learning as my method of instruction. As a teacher, I employ a holistic approach to learning that takes the individual into consideration in a classroom without barriers, where students are encouraged to reflect and ponder on issues and events that matter to them, and where problem solving and collaborative group projects are led in a student centered environment. My interest in technology, with its ability to transform any classroom into a global environment, where students learn to gather information, solve problems, and communicate with peers and experts from all over the globe, decrees it an important component of my teaching, and a great contributor to the enhancement of my instruction. With the aid of technology tools, I have been able to step aside and allow my students to grow as learners beyond the confinements of one classroom, one school, and even one country. Technology has made it possible for me to create a learning environment that is engaging and relevant to my students’ interests and needs. Today, my educational philosophy, twenty years into my teaching career, entails my drive to instill a love of learning in my students and an appreciation for diversity. Who dares to teach must never cease to learn writes John Cotton Dana. This quote defines my teaching and learning philosophy today; for in adopting this thinking, I am embracing and actively partaking in the learning with my students. Although at first glance it would seem that my teaching philosophy has changed over the years, my goal is and has always has been about teaching from the heart – one student at a time – to love learning and to respect and appreciate life in all its diversity. A Roadmap for Technology in Education? I’ve just finished reading the New Media Consortium (NMC) Horizon Reports for both Higher Education and K-12. For those unfamiliar with the NMC Horizon reports, they are the predicting voice on educational technology trends and cover not only global higher education and K-12 schools, but also libraries and museums. These reports are the product of a collaborative research project between NMC and the EDUCAUSE Learning Initiative (ELI). 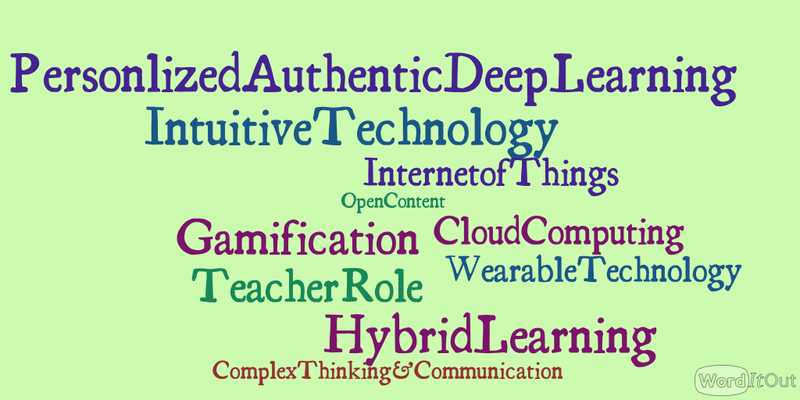 Their aim is to identify and describe technologies that are likely to impact teaching and learning. These reports have been around for 13 years, have been translated (to date) into 50 foreign languages, and have readership in more than 160 countries according to the NMC Horizon website. The reports cover the challenges that impede technology adoption, the key trends that can accelerate educational technology adoption, and the important developments that are likely to affect education spanning over the next 1 to 2 years, 3-4 years from now, and 5 and more years. Their potential to be valuable guides for technology planning in educational establishments is without doubt; however, after asking about 20 faculty members and a number of principals and technology coordinators, I question how many education professionals actually refer to the reports to guide their curriculum planning! As a doctoral student and teacher, I appreciated the scope of the reports, the detailed insights into how trends and challenges affect teaching and learning, and the implications that the reports’ findings can potentially have on policy, leadership, and practice. The outlined trends presented in the Horizon Reports are such that schools would have to flexible and allow for creativity and entrepreneurial thinking. This, sadly to say, is a far cry from the reality of our standardized test driven K-12 environments and our budget conscious Higher Ed institutions. In addition, to successfully adopt these trends, the full commitment and involvement of all education stakeholders, from parents to policymakers, is vital. I saw no mention of preceding years’ trends and challenges in the reports, which is a shame, as a few remarks on the past years’ trends and challenges and extrapolations as to the reasons why the trends took place or not would have been valuable. What constitutes knowledge? What constitutes reality? How do we come to know what we know? Research is usually the tool that we use to describe and explain our reality but that is assuming that there is a reality to explain. The social construction of reality and the role of language in creating this reality is what the postmodernist movement explores. Thinkers adhering to this paradigm question the existence of a reality and the notion of an ultimate ‘truth’ stating that whether we are talking about reality or truth, these are concepts that are prone to shifts and redefinitions based on circumstances and time. Whereas positivists believed that an external objective world existed and attempted to explain it with ‘what’, ‘when’, or ‘how much’ questions, and interpretivist/constructivist researchers emphasized the subjective interpretive component of this world, asking ‘why, ‘How does’, and ‘what meaning’ questions, postmodernists question the scientific method itself stating that it is a tool of a specific time and culture and may therefore not be valid for today’s reality and truth. Postmodernist theorists call our attention to expose hidden values and assumptions underlying our questions and demand that we ask questions about our questions, to really look at the world through critical eyes as we engage in new ways of thinking, doing, and being. Postmodernism is a concept that I have yet to fully grasp. 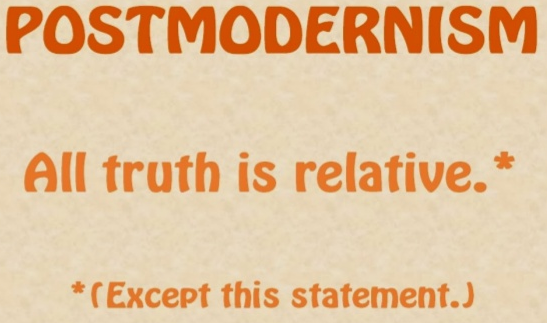 As far as research is concerned, I appreciate the claims that postmodernism makes. Its call for us to question and be uncertain about absolute ‘truth’ and binary concepts such as ‘good’ or ‘evil’ , ‘right’ or ‘wrong’ is healthy in that it provides space for critical consciousness to operate and allows for different perspectives. If nothing else, postmodernism warrants us to re-imagine the grounds upon which we make judgment about what is progress, and provides us with an opportunity to be reflexive in our contributions.